I’ve recently started using the very popular OUAI Haircare line and I’ve become slightly obsessed!! Since it’s not everyday that I find products that really work, I had to share my thoughts on this amazing line. 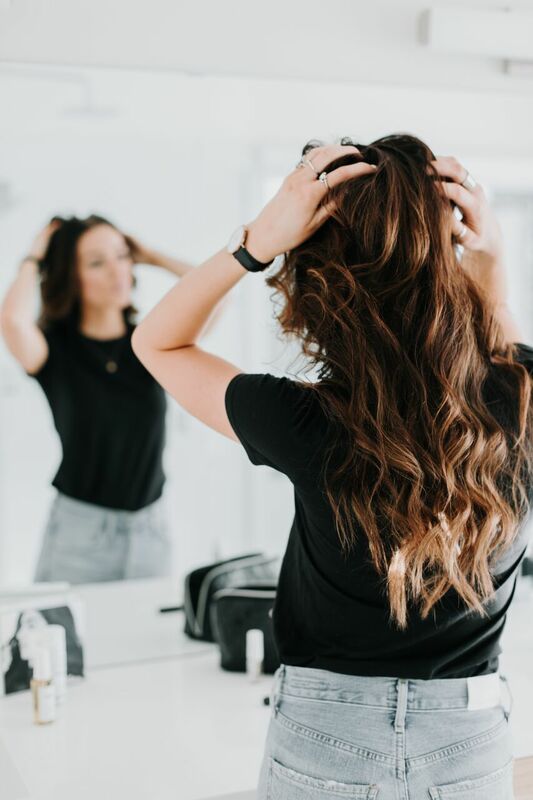 OUAI [pronounced way] was created by hairstylist, Jen Atkin who has been known to style top celebrities hair, such as, Chrissy Teigen, Jessica Alba, Khloe Kardashian and the rest of the Kardashian/Jenner fam…and lets face it, we all know they have great hair! But . . . what is it that separates OUAI from the other numerous product lines out there? WHAT INSPIRED ME TO CHOOSE OUAI? I’ll be honest, I have seen the OUAI Haircare line pretty frequently on advertisements and all over social media but I was a little hesitant on trying it. My sister, also a hairstylist has made me pretty picky when it comes to what products I use. SO…I’ve just gotten used to sticking to the same brands. Not very exciting I know!! What actually inspired me to try OUAI was planning my last vacation. I knew I would be traveling quite a bit with just a carry-on and also spending a lot of time at the beach. I started browsing for a few products that would help to make styling quick but would also pack up easily. After a bit of research, I found out the OUAI line actually had some really awesome and unique travel kits that seemed to be exactly what I was looking for. 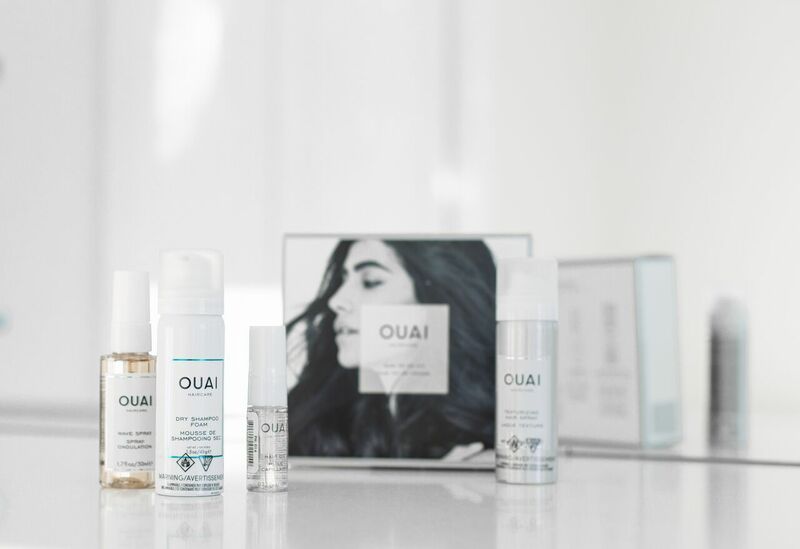 With cute names like All the OUAI Up Kit and Desert OUAIsis Festival Kit – they definitely catch your attention. I also loved that each product is designed to actually help renew and restore your hair to it’s original health [even the styling products]. If you’re someone like me that suffers from dry, brittle hair, then that is a huge must! “Like dry shampoo and hair spray had a baby”! This has to be my favourite product from the OUAI line. I have actually started using it daily! I have pretty fine hair so I love that it adds texture and volume without weighing it down. It also has volcanic minerals that absorb oil and refresh the hair. I was a bit skeptical of this product as I have never been a huge fan of dry shampoo. I have tried sprays and powders but I always found that they left a sticky residue in my hair that I could feel and sometimes see. This dry shampoo foam actually goes on wet but after a few minutes of massaging into the hair and scalp, it actually dries quite well. I found it still felt like I had a bit of product in my hair but it definitely helped to cleanse away oil. I have been loving this product for days when I don’t feel like styling my hair. You can use it any time to add texture but I found it works great to lightly spray on hair before bed and then apply a simple braid. It really helped to give my hair a nice textured wave that’s easy to shake and go! I am a strong believer in using a hair oil frequently. I typically apply an oil before and after styling. This OUAI hair oil is great as it not only helps to tame frizz but it also acts as a heat protectant and split-end mender…a key to shiny, healthy hair. I’m always looking for a great hair masque as I’m pretty rough on my hair. I use a lot of heat, I style often and I travel to other climates pretty regularly, which is all very damaging. Lately, I have been trying to apply a treatment at least once a week to help my hair stay healthy and prevent breakage. I found this mask works great. It’s infused with artichoke leaf extract to seal the hair cuticle and prevent further damage. I typically leave these masques on overnight in order to gain full benefits. Side Note*** All OUAI products are available online or at your local Sephora!